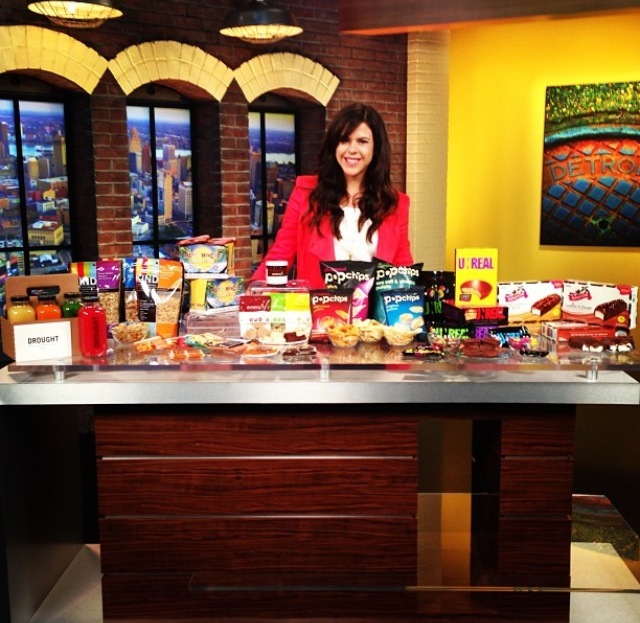 This past fall I got to share some of my favorite healthy snack options on Fox Detroit. We ate, we schmoozed, we ate some more and we didn’t feel the least bit unhappy about it because these snacks were g-double-o-d and good for you too! It’s a tempting world out there- football season lead us into Halloween which took us to Thanksgiving then into the holidays and now it’s all about Valentines day it’s been a slippery slope of candy, chips, fried food and all sorts of treats that of course taste great but definitely isn’t great for you. To help with that I’ve tried and found the best snacks out there that aren’t only good for you but they TASTE good too. Because lets face it, if our snack or dessert tastes like cardboard we don’t care how low calorie it is, we are reaching for the gigantic muffin and our muffin top is just going to keep growing. These Raw, Organic, Cold-Pressed Juices are made in Detroit and are absolutely amazing! Their delicious flavors like apple lemon ginger, carrot coconut and watermelon are all produced in intimate batches to assure quality and flavor consistency. These juices are the perfect way to get your fruits and veggies in while still feeling like a treat! KIND Healthy Grains is being KIND to us because their DELICIOUS Granola has less fat, sugar and calories per serving than typical granola– and on top it’s Gluten Free! (and it’s usually hard to find Gluten Free Granola!) They come in six fabulous flavors which are made up of a blend of five 100% whole grains. Such great grains that one serving fulfills 1/3 of your daily whole grain requirement. It’s great with milk or yogurt (try adding berries) but truthfully this stuff is so good on it’s own that it’s a great snack to take in your purse or gym bag on the go! It is SO hard to find a fruit snack that isn’t packed with sugar and so many of them don’t even have real fruit! Matt’s Munchies to the rescue! I have become totally addicted to these and carry one in my purse at all times. These fruit snacks have absolutely NO added sugar- and are made with Certified USDA Organic fruit. They are also gluten free, kosher, pareve and vegan, no nuts, no soy and no GMO’s just pure deliciousness that are FUN TO EAT! They are great for on the go because they come in one serving bags and most of them are under 70 calories. These little gems are vegan, gluten free and raw but don’t let that fool you because they are so satisfying and delicious. Made with shredded coconut and coconut oil you can feel good about getting in a healthy fat. Coconut oil is often called “athlete’s fat” because of it’s fatty acid chain length. Coconut is composed of medium chain fatty acids which work with the body and are immediately converted to energy after consumption. Many years ago, coconut started getting bad press because on the nutrition label, it says that its saturated fat content is high. This is true, but it is the way that this saturated fat is comprised that makes it such a special and healthy fat. These macaroons come in delicious flavors like Dark Cacao, Lemon, Mint Chocolate Chip and Chai Spice- and each one is better than the next. Take one spoon of their chocolate sauce and you will consider becoming a raw, gluten free vegan yourself. Their richly luscious dark chocolate sauce (which is made with only FIVE ingredients) is heavenly when drizzled over raw fruit, ice-cream, blended into smoothies, or even enjoyed straight from the jar. Take one bite of a popchip and you will become instantly addicted– in the best way possible. A single serving bag has only 100 calories yet has more chips per serving than fried chips. They are NEVER fried (unhealthy) and they are never baked (undelicious) They are popped (so much more fun!) They come in 14 flavors- original and bbq are must haves for football season but they have tons of fun flavors like Sweet Potato and Katy Perry’s own flavor- Katy’s Kettle Corn. They even have a line of popped tortilla chips. On top of being super low in calories I love that they have no fake colors, no fake flavors, no preservatives, no trans-fat and no cholesterol- they’re even certified kosher and gluten-free! These chips are incredibly crunchy and incredibly satisfying but if you eat the whole bag (which I may or may not have done) there is nothing to worry about! UNREAL has reinvented America’s favorite candy, replacing all of the junk with real food ingredients, reducing the sugar, and making it taste better. Their candy has no corn syrup, no hydrogenated oil, no artificial flavors, no GMOs, no synthetic colors, AND has 30-40% less sugar than comparable candy products on the market today! Not to mention this genius idea was all started by a 13-year-old kid whose mission is to take the junk out of junk food. You can get these at Target or on their website and are a GREAT option for candy that you can feel good about giving your kids. Prices ranging from $1.19 to $1.49 for individual bars and $3.99 to $4.99 for family sized bags. Skinny Cow Ice Cream Candy Bars are made with low-fat ice cream and are a perfect treat to enjoy after meals or as a snack. they come in two delicious flavors: Salted Caramel Pretzel (you can’t beat the taste of a layer of salty caramel over vanilla ice cream topped with a layer of chocolate) and Cookies ‘n Dough (crunchy cookie bites and a cookie dough layer dipped in yummy chocolate!) – and here’s the best part (well aside from being totally mouthwatering) both only have 160 calories each! Ah-Mazing!